Money Conversations Are Not Easy! Did you know that conversations about money are often the most difficult ones to have? This is true because money is not just a means of exchange. People associate emotions and values to money far beyond its purchasing power. When you talk about money, you are speaking from the perspective of what money means to you which may not be what it means to your partner. For example, if money gives you a sense of freedom while for your partner it provides a deep sense of security, you may have different ideas of how money should be handled together. When both views of money are not honored one of you will become visibly frustrated. People deal with unresolved money frustrations in different ways: some argue, some withdraw, some hide their spending, some hide their money and still others avoid any conversation about money. Regardless of what form money frustration takes, it can ultimately undermine the couple's trust with each other. What were once easy money conversations become volatile or even worse, they stop altogether. This does not have to be. Trust can be restored. Money conversations can work. They can be respectful and productive. Click here to take the Money Focus Assessment and find out how your money conversations are likely to affect your relationship. Being Out of Control with Money is no Fun! For a lot of people, no matter how much money they make, they never seem to be able to save enough. The more they make the more stuff they seem to need. And there is nothing left to save... maybe next month. Life is generally good but at times they feel the anxiety that should a major emergency occur, the money they have will disappear and they will find themselves sinking further and further into debt. They may have tried various methods to gain control over money, but nothing has worked very well. After a few months they abandon the new strategy, even more frustrated than they were before. They do not know what to do. They want a good life without feeling controlled by money. They want to achieve balance with their money but they do not know how. What they need is to take control of their money. Click here to take the Money Focus Assessment and see the degree of control you have with your money. 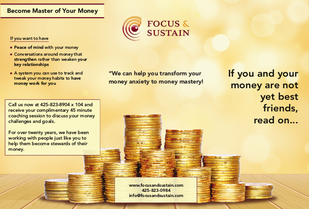 Our Money Focus coaching programs are designed to help you become master of your money. You will use the tools we have to finally take control of your money. You will be amazed at how good it feels to be in control. We understand that your situation is unique and may not perfectly align with the issues above. We customize our approach to meet your specific needs and objectives. In our initial conversations with you we will determine, together, what your priorities and problems are and determine the best course of action to take. You do not have to live with money anxiety. We can help you, just as we have helped so many others, to transform your anxiety into happiness as you finally gain control of your money. Take control of your money today. It is time your money worked for you! 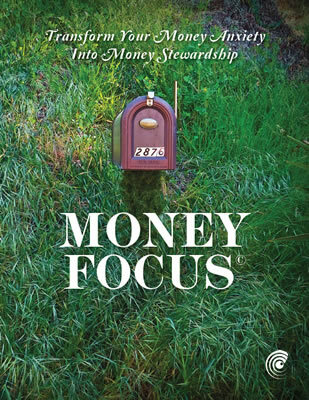 If you have not done so yet, click here to take the Money Focus Assessment to find out where you are in your relationship with money. We invite you to join the many individuals, couples, and families who have transformed their financial anxieties into power and pride in their money stewardship.